Burnley fell to a third away defeat of the season in the Premier League yesterday with a 1-0 loss at Crystal Palace and this time the points were very much deservedly won by the home side on a day when the Clarets struggled throughout. The only goal, a defensive disaster for Burnley, came midway through a first half that was all but totally dominated by Palace and whilst we had a lot more of the game in the second half, we rarely looked as though we might get ourselves an equaliser and eventually fell to this 1-0 defeat after what was surely our worst performance of the season. It spoiled an otherwise good day out on what was a rare rail trip for us, courtesy of some quickly grabbed Black Friday deals from Virgin which would have been rude not to accept and, from reports coming in from elsewhere, we were someone fortunate in our choice of times given a mix of North West club supporters on other trains. 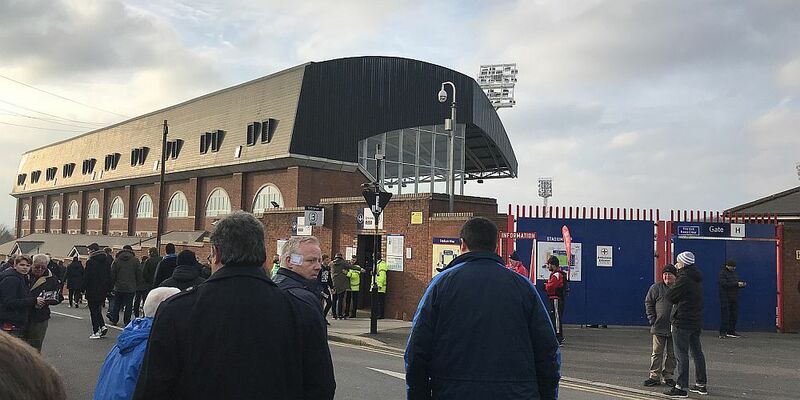 Our port of call for food and drink on the way to Huddersfield recently was a disaster but I’m pleased to say our researcher was back on form on this trip so we were well fed and watered by the time we pitched up at Norwood Junction for the short walk to Selhurst Park. We were facing a team who have turned their season around incredibly, a team who lost their first seven games without scoring a single goal, but a team on a run of just one defeat in eleven games. We, meanwhile, are on our worst run this season, certainly as far as results are concerned. However, both teams are struggling with injuries, Palace were without a number of players as we were we and our line up was probably as most would have expected showing just one change from the last league game on New Year’s Day against Liverpool with Sam Vokes up front and Ashley Barnes on the left for the injured Scott Arfield. Had I known, I’d have taken ear plugs. We know all about their synchronised atmosphere but that was preceded by music over the PA that was absolutely deafening. At least the eagle was flying well. As for the game, Barnes forced Palace goalkeeper Wayne Hennessey into a good save not too long before half time. If I was reporting just our best bits from the first half, that, I’m afraid, would be it. We were very much second best throughout the first period and could so easily have been more than one goal behind. With Wilfried Zaha and Bakary Sako either side of Christian Benteke, they caused us no end of problems. We might have conceded a penalty when James Tarkowski was involved with Sako. Referee Michael Oliver deemed there was no offence but I’m sure at the other end I’d have been screaming for a penalty and bemoaning our rotten luck had we not got the decision. The goal came midway through the half. As well as Sako did, it was poor defending. Coming in from their left, Phil Bardsley, who had a wretched afternoon, didn’t close him down, his shot went through Tarkowski’s legs before Nick Pope got a leg to it but couldn’t prevent it going in. Charlie Taylor, who had a difficult time during the first half but was probably our best player after the break, then put us in all sorts of trouble with a header back to Pope. A second goal looked certain but Ben Mee miraculously got back to clear off the line to prevent James McArthur from doubling their lead. I think we were all relieved to get in at half time with the us just 1-0 down although not so with having to be deafened again until the players returned for the second half. On a more positive note, the second half was better. It wasn’t good enough, but it was better although Palace were the first to get any sort of effort in on goal. For the first quarter of an hour or so in the half it looked like a game between two poor sides but then we changed things with the introduction of Georges-Kévin NKoudou who replaced the totally ineffective Jeff Hendrick. We went 4-4-2 with Barnes and Vokes up front and NKoudou on the left. He made a couple of runs and got the Burnley fans excited. He did at least run at the Palace defenders and push them back. On a couple of occasions we certainly caused them some problems, but too often we resorted to hitting long balls up the pitch in search of the front two who were, frankly, winning close to nothing. Embed from Getty ImagesBurnley were definitely the more likely side now but the only real chance we got was a ball for through for Barnes to chase. Hennessey got out of goal quickly to prevent him getting a decent shot in and that was our last chance of getting something. It proved to be our last chance with the only excitement to come after that when Zaha lost the plot after smashing into a cameraman. I’m still not sure how on earth Taylor landed himself with a yellow card for that. Overall, it really had been a very disappointing performance in which I thought only Mee, Taylor and, to an extent, Barnes came out with any credit, but it’s not often I’ve written that this season if at all. I’ve been disappointed with results, devastated with those when Arsenal, Manchester United and Liverpool scored late goals against us, but in terms of performance I think this was probably our worst this season and the only time I’ve left a ground really disappointed with how we’ve played. It ends a record too; we’ve never previously lost a top flight game at Selhurst Park. It was only our fifth such game there but we’d won three and drawn one of the other four. I didn’t think I’d be writing about Burnley in mid-January and having to report on only our third away defeat of the season. There are still only five teams with more away points than us this season. Right now, it’s just looking potentially more concerning that it actually is because of the run of games without a win, but surely we all knew this would happen at some point in time this season. We’re still seventh so there’s not much to be negative and it’s only Manchester United next. Crystal Palace: Wayne Hennessey, Timothy Fosu-Mensah, James Tomkins, Martin Kelly, Patrick van Aanholt, Wilfried Zaha, Luka Milivojevic, Jairo Riedewald, James McArthur, Bakary Sako, Christian Benteke. Subs not used: Julian Speroni, Pape Souaré, Aaron Wan-Bissaka, Damien Delaney, Yoan Cabaye, Chung-yong Lee, Sullay Kaikai. Burnley: Nick Pope, Phil Bardsley, James Tarkowski, Ben Mee, Charlie Taylor, Jόhann Berg Guðmundsson (Nahki Wells 85), Steven Defour, Jack Cork, Ashley Barnes, Jeff Hendrick (Georges-Kévin NKoudou 63), Sam Vokes. Subs not used: Anders Lindegaard, Matt Lowton, Kevin Long, Ashley Westwood, Jon Walters. Yellow Cards: Steven Defour, Phil Bardsley, Charlie Taylor.